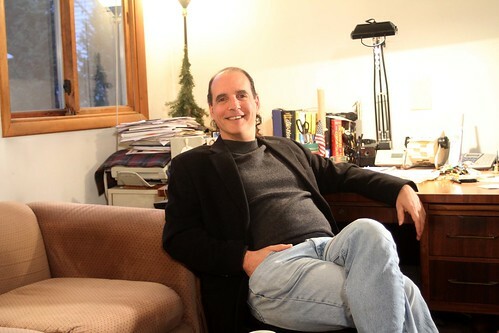 In light of the outrageousness that occurred at the recent library drop box ad-hoc committee meeting, this week, I had the opportunity to chat with Danbury City Councilman Paul Rotello about the on-going fiasco. For those who don't know, it was Rotello who requested an ad-hoc committee be formed to find a solution to the drop box controversy that continues to cause a great deal of irritation to many residents who use the service. Not holding back in his frustration on the matter, Rotello gave his thoughts regarding the dismissive tone among local lawmakers who are against placing the boxes back on West Street. He also reiterated his simple solution to the matter that would resolve the matter and have the boxes placed back at their original location. In part one of my three part interview with the councilman, Rotello provided a history lesson regarding the rationale behind the placement of the boxes on West Street and why the boxes were re-located to behind the library. Be sure to catch part 2 and 3 of my interview with Councilman Rotello in the upcoming days. Today, the youth led immigrant rights group, CT Students for a DREAM, will be hosting an important event at Western Connecticut State University in support of the Development, Relief, and Education for Alien Minors (DREAM) Act. Documented and undocumented students from WCSU, ECSU, CCSU, UCONN, Trinity College, Yale University, Quinnipiac University, Naugatuck Valley Community College, Sacred Heart, Norwalk Community College, and Connecticut public high schools will convene in support of this pivotal piece of legislation (DREAM Act), a bipartisan bill that would acknowledge the clear fact that these individuals, who were brought by their parents to the United States at a young age, are indeed Americans and would provide them with an earned pathway to citizenship. During the rally, undocumented students will share their stories of hardship, struggle and triumph; stories about growing up in the country they call home but where current immigration law undermines their sense of identity, their talents, and their aspirations, and disregards the vital contributions they make to their communities; stories that shed light on an injustice and stories that highlight how they are denied the right to “life, liberty, and the pursuit of happiness.” Through this event, we will show that DREAMers are indistinguishable from their fellow Americans; honest, hard working individuals who want to realize their full potential and continue to give back to their communities. The DREAMAct is scheduled for debate and possible vote next week. As a strong advocate for immigrant rights in Danbury, I'll be on hand to show my support for this important cause and will providing a live video stream of this event starting at 1PM. UPDATE: Here's the re-broadcast of the DreamAct presentation. I will have a follow-up post with interviews with sponsors of the event later. The Danbury 11 case isn't the only civil rights case filed against the U.S. Immigration and Customs Enforcement in Connecticut. Here's the latest in the case involving the actions of ICE during a raid in Fair Haven. Three days before a government-ordered flight back to his native Ecuador, Washington Colala was granted a week’s reprieve by a federal court judge. Colala (at right in photo) had been ordered to board a 7 p.m. flight to Ecuador on Monday. He would have been taking some powerful testimony with him. His lawyers say that’s why the government seeks to have him deported. Colala (at right in photo) is one of 32 Latino immigrants who were swept up in immigration raids in Fair Haven in 2007. Now, three years later, he’s part of a federal civil rights lawsuit, which argues that U.S. Immigration and Customs Enforcement (ICE) agents violated his constitutional rights when they came into his apartment on the morning of the raids. In the midst of that case, ICE has moved aggressively to deport him. Just before Thanksgiving, he was given a deadline to leave the country: Monday, Dec. 6. Colala has bought a ticket and was ready to fly from JFK to his native Ecuador on Monday night. Meanwhile, law students at Yale were scrambling to find a last-minute exception to keep him in the country. On Friday afternoon, their efforts paid off. Judge Stefan Underhill, the federal court judge overseeing the civil rights suit, entered an order staying Colala’s deportation for a week. He did so to give Colala’s lawyers time to argue that he should be allowed to remain in the country and testify in the case, said Mark Pedulla (at left in photo), a student attorney on the case. After the 2007 raids, Yale students worked with about half of the arrested immigrants to appeal their deportation orders, but not Colala. They argued that the ICE raids had been conducted illegally and were able to overturn the deportation orders for several of their clients, including Colala’s housemate. They did that with the help of testimony from Colala. Colala, who’s 44, said ICE agents came into his apartment illegally in June of 2007 and arrested him without identifying themselves. His lawyers said his testimony about that incident was instrumental in a successful overturning of a deportation order against Colala’s roommate’s, by showing that the agents violated the 4th, 5th, and 10th Amendments. “Immigration officers entered my house without consent ... based on lies ... and they arrested me,” Colala said about the raid on his apartment in 2007. It wasn’t until a half-hour later, after he had been in handcuffs for some time, that ICE agents identified themselves, he said. “It was quite humiliating,” Colala said. After the raids, Colala (at right in above photo) did not join the group of arrested immigrants working with Yale law school. He appealed his deportation with a different attorney, used a different argument, and failed to overturn his deportation order. That means he can now be forced to leave the country, even as he’s part of another case stemming from the raids, the civil rights lawsuit that began in October 2009. Colala would likely share that same potentially incriminating testimony he did before when the pending civil rights case comes to trial, but from his home in province of Pastaza, he would have been unable to participate in the civil rights trial. Despite several appeals and intervention attempts by his lawyers, Colala was being forced to leave the country on Monday. The fact that Colala’s testimony resulted in the overturning of his housemate’s deportation order shows that his claims are credible, Pedulla said. This is yet another victory by the law students at Yale...students who are also working hard to prove their case in the Danbury 11 matter. Here's video footage of the meeting that has many in the public up in arms. I'll in the process of writing a post that will rebut EVERY argument made against placing the boxes back on West Street as well as give my take on the tone-deafness of the mayor and members of the committee. SPECIAL THANKS to the great John N. of the local access show Danbury Live for providing the footage. Sonic Drive-In approval another example of irresponsible development? Sonic, America's Drive-In, (a hamburger and shake joint with drive-through, and car-hop service,) earned city approval Thursday for a restaurant in the parking lot of Expect Discount and Nardelli's Restaurant on Newtown Road. Work on the restaurant is expected to start in the spring. The restaurant in the parking lot will force drivers to change how and where they drive in the lot. A Sonic restaurant is so popular and it attracts so many cars, the city's review largely focused on how cars will come and go from the lot and where they will line up for the restaurant's drive-through and car-hop service. The plan forced the city's planning officials to review the traffic pattern in the lot and in the neighborhood. The state Traffic Commission reviewed the plan and approved it, as did the city. Sean Hearty, the permit center coordinator, said the traffic issue in the Expect Discount parking lot was complicated. He said the city had already approved a restaurant on this same spot in 2007 (at that time it was a Starbuck's with 24-hour drive-through service,) but that was never built. Sonic avoided commission review because of the previous approval. The planning staff reviewed this proposal and approved it Thursday. Although the restaurant was approved, it's unfortunate that the proposal didn't go through the hands of the planning commission where this issue could have a full public hearing as opposed to the issue being handled by a department. For example, Elmer's Diner was able to avoid certain commission reviews because it technically fit within the same site footprint as the previous property's owner, Ann's Place, although the diner generated considerable more traffic than anything that would had come from Ann's Place. In short, because the city originally approved the Ann's Place's site footprint, because Elmer used the exact same footprint for his diner, he was able to get his place build in the location although it's clearly located in an unsuitable location. To say traffic on Newtown Road is congested is an understatement (how many times have people tried to make a left onto Newtown Road from Dunkin' Donuts). Although there is a traffic light at the Expect Discounts lot, traffic flow in that area is very tricky and can become VERY congested at certain times throughout the day. Lets hope that the location of this restaurant does not make a bad traffic situation more complicated for commuters. BTW: If you haven't already, bookmark the Danbury Patch! You call this news Dirk?!? It's articles like this that demonstrates why the Danbury News Times desperately needs more political reporters...or get their priorities straight. On Tuesday night, News-Times "political" reporter Dirk Perrefort filed this gem of a fluff piece. State Sen. Michael McLachlan, a longtime member and past president of the Danbury Kiwanis Club, recently unearthed the organization's original charter. McLachlan, a Republican elected to his second term in November, said he was cleaning out his attic recently -- at the urging of his wife -- and found the document, which was signed on Oct. 15, 1942. The state lawmaker said a former president gave him the document more than a decade ago when he served as the club's chief official. It had been in his attic ever since. On Tuesday the document, which has since been framed, was placed on the wall in the taproom at Chuck's Steak House on Segar Street. To recap, Mike McLachlan was "cleaning" out his house and found the original charter to the Kiwanis Club...a document that was given to him ten years ago. Two words: SO WHAT. Four more words: WHO GIVES A CRAP! As the political writer for the News-Times, this article is a joke...in fact, knowing how things operate in this city, this article probably originated from the do-nothing State Senator giving Perrefort a call and asking for a favor (you know who politicians love to see their name in the paper. On Tuesday, the city council ad-hoc committee met to discuss the library boxes situation and from the feedback from those in attendance, the whole meeting was a complete joke. I'll have MUCH more on what really transpired at the meeting later. On Tuesday, the city council ad-hoc committee meeting was held to consider raising permit fees in order to help fund the building and permit department. Danbury's building permit fees may rise within the next few months, but how much they might rise, and who Danbury competes with for commercial or residential development is the question. Building Inspector Leo Null presented a proposal to members of the City Council at City Council subcommittee meeting Tuesday, and he had been instructed by Finance Director David St. Hilaire to compare Danbury's permit costs to those of other state cities. The committee agreed it needed more information, and Danbury Mayor Mark Boughton suggested the city speak to the Connecticut Conference of Municipalities, and ask that organization to compare building permit fees in Danbury with those of towns and cities. On Tuesday, CityCenter Danbury held a tree lighting ceremony at the library center. Danbury lit its holiday lights Tuesday night before a crowd of 200 people who braved the light rain. The crowd saw a holiday dance performance by 5-6-7-8 Dance Arts, performed by Bridget Carroll, Theresa Carroll, Claire DeChaiaro, Mariah Fortunato, LeAnn Golino, Allie McCarthy, Ameila McPartlin and Jennifer McPartlin. That was followed by a sing-a-long by the St. James Episcopal Church Choir, and Danbury Mayor Mark Boughton counting down to the lights and a visit by Santa. Now, those were THREE articles (two of which were political) ALL HAPPENED ON TUESDAY! Perrefort ignored the REAL NEWS in the area and covered Senator McLachlan's dog and pony show. 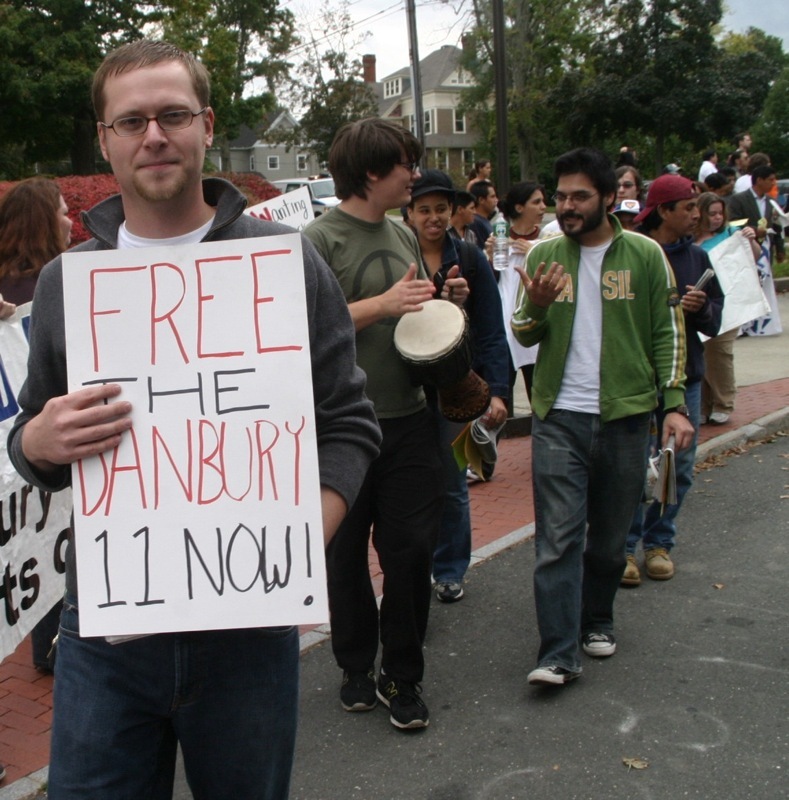 Did I mention that the THREE ARTICLES (and photographs) from the Danbury Patch was done by the ONE PERSON...former News-Times political reporter, and current Danubry Patch editor Mark Langlois. I guess the term "all the news that's fit to print" doesn't apply to the Perrefort or the News-Times. No wonder reporters are leaving print media and joining the AOL-PAtch bandwagon in droves. UPDATE 2: I'm learning more about what transpired at the ad-hoc committee meeting last night and to call the dog and pony show from the mayor and committee members Colleen Stanley and Phil Curran a sham is an understatement. I'll post the video from the meeting as well as the fallout from what happened later this week...prepare to be outraged! Unfortunately, I was unable to attend the ad-hoc committee meeting on the library drop-box fiasco but thankfully Mark Langlois at the Danbury Patch was on-hand and filed this report. 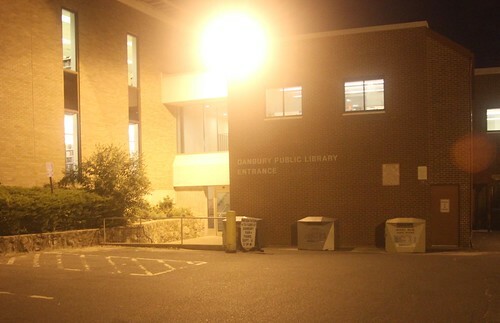 The city agreed to look for a new option for the controversial library drop boxes that have been making the rounds outside the Danbury Public Library. The idea of looking for a new option arose Tuesday during a one-hour ad hoc committee meeting of the City Council. 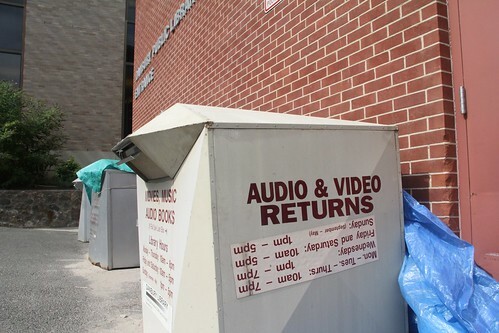 The most recent problem arose this summer, because for the last 11 years, the boxes were located on a traffic island one street crossing distant from the library plaza. A city worker collected the books twice a day for the last 11 year, but he is now on long-term disability leave, and he can't collect the books. Library workers have objected to the task for three reasons. They have to push a cart loaded with two plastic boxes 50 yards from the library, cross a busy street, load the plastic boxes with the books people dropped off, then push the cart, plastic boxes and books back across the busy intersection and then 50 yards back to the library. 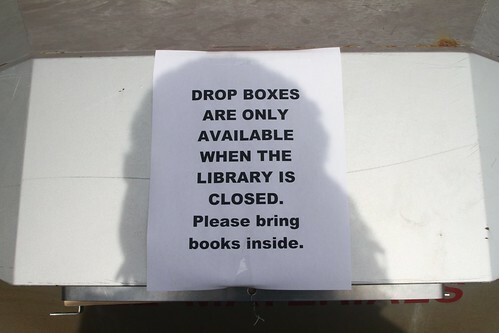 To solve that problem, the city moved the boxes to the parking lot behind the library, and that solution appeared to please the library workers, although it led to loud objections from patrons. Now the patrons have to get out of their cars. Christine Rotello of Danbury, said there are three types of library patrons very seriously inconvenienced by moving the boxes off the traffic island, and those people have rights. "You have your parents with children," she said, and drew a graphic picture with words of a mother having to unstrap her children, grab her pocketbook, grab the books, and herd the children across traffic and the plaza to reach the drop box. She said similar problems arise for the elderly and for people with handicaps. "Why not put them right back where they were before," Christine Rotello asked. The removal of the drop boxes from their former location is unacceptable plan and simple. Although our mayor talks about looking for a solution to the matter, there is really only one sensible solution...BUT THE BOXES BACK TO THEIR ORIGINAL LOCATION and tell the library staff that they have an additional responsibility. Any other "option" is laughable and unrealistic and Boughton knows it. Although no decision arose from the meeting, Danbury Mayor Mark Boughton said he would visit the library Wednesday with Public Works Director Antonio Idarolla to look for a possible solution behind the library that would create a way for people to drive up to a drop box and not climb out of their car. "I'm not promising anything. I'll take a look at it," Boughton said. Among the longer-term options is the city's plan to take the Union Savings Bank behind the library and use its drive-up window area as a daytime drop off and pick up area. That is possibly three years off. A second long-term option, Boughton said, is during the renovations to the former Immanuel Lutheran School next to the library, perhaps the city could include drop off boxes somewhere in the parking lot. It is close to the library, and it doesn't involve crossing any streets with carts loaded with books. As the article outlines, these options are VERY LONG TERM and unnecessary since there was no problem with the boxes at the old location...the problem stemmed from a lack of funding to have ONE PERSON go out and empty the boxes. In the end, the problem with the boxes came down to economics. With ALL THOSE EMPLOYEES at the library, you would think they could find ONE person who would have no problem emptying the boxes. Paying someone to do this small job would cost peanuts. Majority Leader Harry Reid (D-Nev.) said he would file a motion Tuesday so the Senate could take up the DREAM Act, setting up a showdown over the bill that would provide some young, undocumented immigrants a path to citizenship. The DREAM Act would open up a channel for citizenship to immigrants who were illegally brought to the United States as children. To qualify for legalization, immigrants must have entered the U.S. before age 16, lived in the country at least five consecutive years before the bill’s enactment; been admitted to a college or earned a high-school diploma or GED certificate; and should have no serious criminal record. Those who receive conditional resident status would need to attend college or serve in the military at least two years. Senator Reid getting the 60 votes he need to stop a filibuster is going to be tough and the Democrats will have to compromise with moderate Republicans in order to move the bill forward. That being said, it's great that Congress is FINALLY moving forward on this important piece of legislation. Bethel voters will finally get to voice their opinion on the town's proposed $2 million Road Renewal Plan next Tuesday, Dec. 7. The referendum was approved Monday night at a special town meeting held at the ﻿Bethel High School﻿ auditorium. The ﻿original $8.5 million, multi-year Road Renewal Plan ﻿was first proposed by First Selectman Matthew Knickerbocker back in June, and has since been changed to only bond $2 million, ﻿per concern of the Board of Finance﻿. After the discussion period, those present officially voted to adjourn the meeting with the plan going to referendum (and its date and time), which only had a couple dissenters. "I strongly think the $8.5 million was better for the town; it would have given our residents assurance that they wouldn't have to go back again and again through this process," Knickerbocker said. "...I want to assure the residents of Bethel that I am going for the rest of the package for the next budget cycle." The vote will be held next Tuesday, Dec. 7 from 6 a.m.-8 p.m. at the usual town polling places: the Clifford J. Municipal Center, the Frank A. Berry School and the Stony Hill Fire Station. Absentee ballots will be available at the Town Clerk's Office starting Tuesday, Nov. 30 till Monday, Dec. 6. The office is open on weekdays from 8:30 a.m.-4:30 p.m. Besides the rants from the usual suspects, the vote went as expected and the residents of Bethel will finally have their say on the matter. UPDATE: My GOD! Talk about lack of quality reporting. If you want to know why journalists in the print media are jumping ship and joining the AOL-Patch service, this laughable News-Times blurb on last night's vote in Bethel should explain things. This afternoon, Congressman Chris Murphy paid a visit to Danbury and Waterbury to speak out against Gov Rell's proposal to eliminate of the Metro-North rail service. The recommendation to eliminate the service in Danbury and Waterbury was one of several spending cut proposals Rell suggested to state lawmakers last week. From this afternoon in Waterbury, here's highlights of Congressman Murphy's presser. Murphy has long been a supporter of the rail branch lines, holding riding meetings on the Waterbury and Danbury lines to discuss how to expand service and increase ridership. He firmly believes that accessible, affordable commuter rail service is essential to Connecticut's future economic development, and he, along with the rest of the Congressional delegation, have been fighting for and winning federal funding for commuter rail in the state. In Danbury, the line is currently undergoing a signaling system update funded by federal stimulus dollars and state resources. The state has committed $10 million to make a variety of capital improvements to stations along the MetroNorth New Haven line, including the branch lines. The 27-mile Waterbury branch is the longest of the three New Haven branch lines, and is poised to be a major commuter resource if upgraded. Meanwhile, the Connecticut Department of Transportation is nearing the completion of multi-year feasibility scoping studies to examine cost-effective alternatives for increasing ridership on the Danbury, Waterbury, and New Canaan branch lines. Yet last week, Governor Rell sent a letter to the Connecticut General Assembly outlining ways to cut state spending, including eliminating service on the state’s three branch lines. 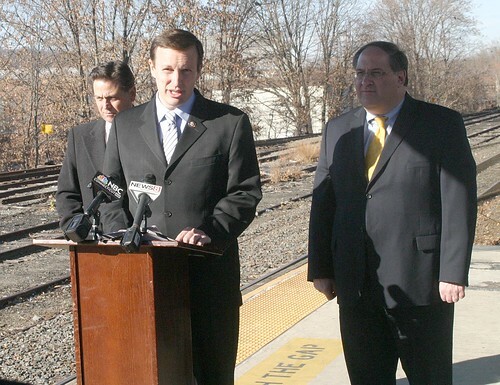 “Put simply, Governor Rell’s proposal to eliminate service on these branch lines would be a disaster for Connecticut commuters at a time when we are working diligently to secure additional federal support for their expansion and improvement,” said Murphy. Tonight, the residents of the town of Bethel will have an opportunity to have their say regarding the town's road repair proposal. On Monday, Nov. 29, The Town of Bethel will hold a special town meeting at the ﻿Bethel High School﻿ Auditorium at 7:30 p.m. The meeting gives Bethel's legal voters the opportunity to vote the ﻿Road Renewal Plan﻿, which would put it to a town-wide machine vote tentatively on Tuesday, Dec. 7. The Road Renewal Plan was first proposed by the Board of Selectmen to the Board of Finance on ﻿June 1﻿. The original plan proposed to bond $8.5 million over a ten year period to fix 31 of Bethel's 83 miles of road and three parking lots. On Nov. 9, the Board of Fiance voted 4-3 to ﻿send the plan back to the Board of Selectmen﻿, with an advisory vote of 5-2 to reduce the bonding amount to $2 million. Several Board of Finance members cited the state of the economy as their main concern for the original $8.5 million plan. On Nov. 16, The Board of Selectmen unanimously voted to bond $2 million as "Phase I" of the Road Renewal Plan. Knickerbocker said he has a list of top priority roads to be fixed in this first phase.﻿ That following Thursday in a special meeting, the Board of Fiance approved the new plan that is now in the hands of the Bethel voters. The delay in the road repair proposal has angered many residents in Bethel who accused members of the Finance Board of being obstructionists and playing dirty politics. Given the volatility over this issue, I'm sure tonight's meeting will be eventful.